HMD Global is on launch spree. 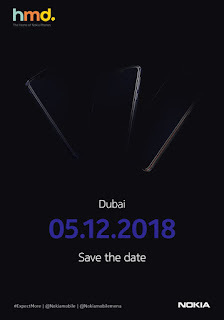 After unveiling numerous smartphones in India and across the globe this year, the company is set to host a launch event, where it will be unveiling three smartphones in Dubai on December 5. Juho Sarvikas, the Company’s Chief Product Officer confirmed the event with a vent teaser along with the caption #ExpectMore, where it shows off as many as three smartphones side panels. Reports reveal that the three smartphones to be launched include Nokia 2.1 Plus, Nokia 8.1 and the flagship Nokia 9. Also it reveals that the smartphones on left and center sporting a notched display but the one on the right don’t.